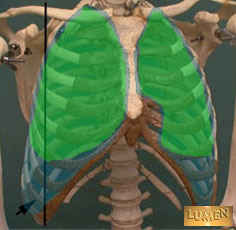 The pleural cavities are closed sacs enveloping each lung. 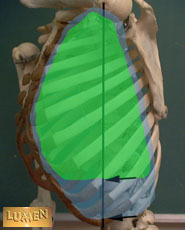 Each cavity comprises a visceral layer (green) and a parietal layer (blue). The visceral layer is closely apposed to the lungs and cannot be dissected from the surface. 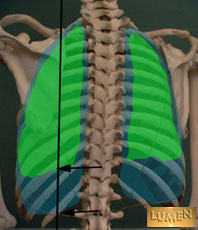 The parietal layer is thicker and is attached to the walls of the thorax (e.g., diaphragm, ribs, etc). 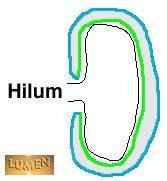 The layers are continuous at the hilum of the lung. It is important to understand the reflections of the parietal and visceral pleura on the thoracic wall as seen from anterior, lateral, and side. Generally, the visceral pleura (lungs) are 2 ribs more superior than the parietal pleura at mid inspiration.